You may not know Minneapolis as a music town, but it most certainly is. Over the years, the mid-size Minnesota city has developed a reputation for nurturing great local acts in a range of genres from hip hop to punk rock to synthpop. The best place to catch a show is in one of the following intimate venues, where, unlike the mega arenas like the Target or Xcel Centers, the drinks are cold, the music is loud and you can snag a spot right up front. This duo of venues is the most well-known in the Twin Cities, located in a renovated Greyhound bus station in Downtown Minneapolis. Starting in 1970, First Avenue has provided a space for local musicians to play while also drawing big names. It’s sister spot at 7th Street Entry offers an even more intimate concert, holding just 250 people. The punk rock scene thrives at Triple Rock Social Club, a restaurant/bar/music venue in the Cedar-Riverside neighborhood. It’s a small space, but they’ll pack people in for a big show. If you arrive early, you can snag a seat at the bar counters facing the stage – otherwise, get a place in front to rock out. Ear plugs might be a good bet. Modern and industrial, Icehouse may be best known as a restaurant, but it’s also a great place to see live music. The space itself is wide open, allowing you to see the stage and hear the music from nearly every seat in the house. Shows start around 10 p.m. but definitely arrive early for a quick bite and craft cocktail. This quaint bar in the North Loop neighborhood is a lofty, chill spot to catch a show. With VIP table seating upstairs that affords great views of the stage and standing room on the main floor, it’s intimate without feeling cramped. Keep your eye out for local bands as well as an array of international artists across many genres. 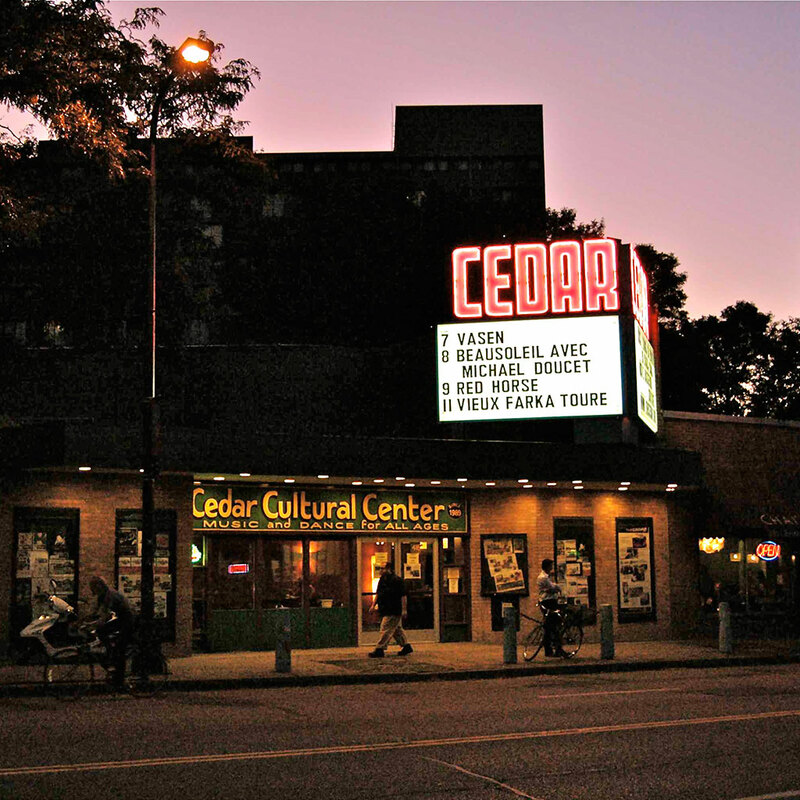 Just down the street from the University of Minnesota’s West Bank campus is the Cedar Cultural Center, a non-profit concert venue frequented by indie artists. The space is a little odd and can sometimes give off a high school talent show vibe, but when people pack in, it’s a great venue for dancing and letting yourself go. Hit up one of the Somali restaurants located nearby before the show – whether or not you choose to booze, your stomach will thank you. This upscale and intimate club focuses on classics like bluegrass, Motown, and funk as well as World music like Brazilian jazz, New Orleans brass, and Hawaiian slack-key guitar. Lounge at your table with a light snack or head up to the small dance floor. With a focus on rock, the Cabooze is a great venue for those that love to be part of an energetic crowd. In the summer they put on a handful of shows outdoors, definitely worth taking advantage of. The Joint is right next-door and serves up pizza by the slice in case you need a quick bite of hot, salty, cheesy goodness to amp you up. A Dinkytown favorite, the Varsity is a great little music venue that draws all kinds of artists to its warm and comforting stage. Touches of luxury are mixed with shabby-chic vibes while twinkle lights and chandeliers hang overhead, setting the scene for a low-key performance space that still affords upbeat acts the chance to excite the crowd. Get up close to the stage or relax on the couches near the back, but don’t skip checking out the unique bathroom – that sounds weird, but trust us.